Builder confidence in the single-family 55+ housing market edged down but remained well in positive territory in the second quarter of 2015, according to results from NAHB’s 55+ Housing Market Index (55+ HMI) survey. 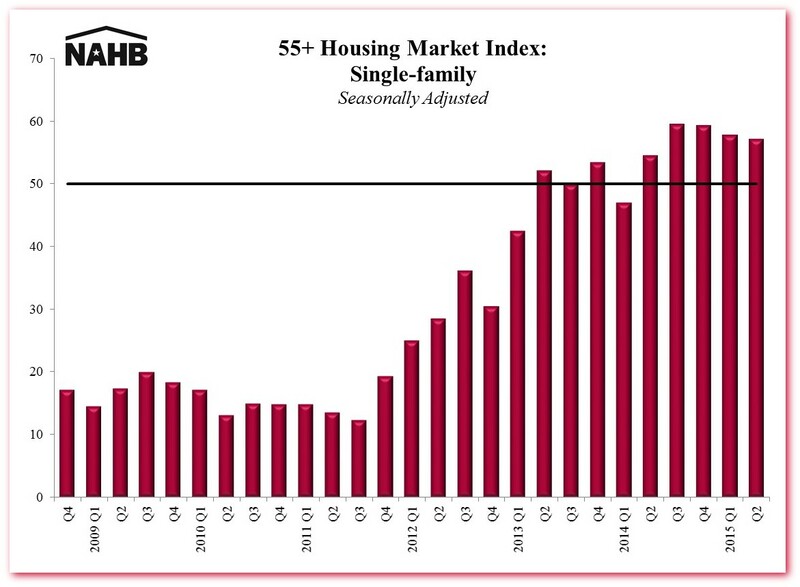 The 55+ HMI for single-family housing dipped a single point, from 58 in the first quarter to 57—marking the fifth consecutive quarter the index has been above 50. 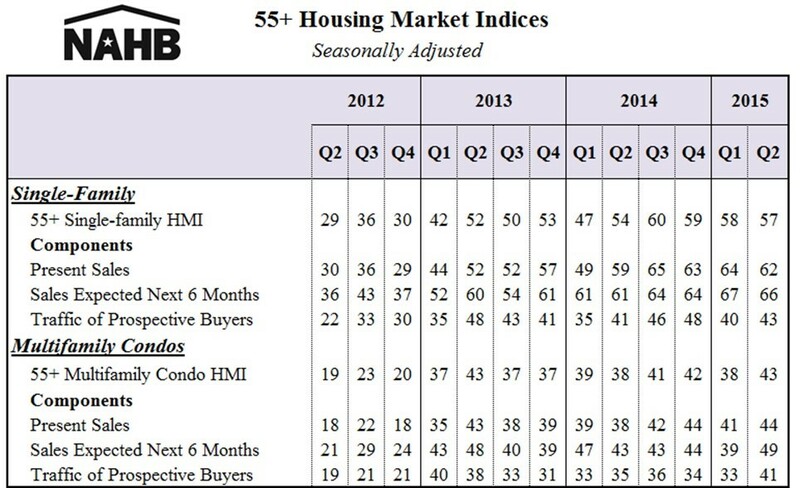 Every index produced from NAHB’s 55+ HMI survey lies on a scale of 0 to 100, where 50 is a key break even point. An index above 50 occurs when builders with a positive outlook on the market outnumber those whose view is negative. The survey covers 55+ multifamily condominiums as well as single-family housing. 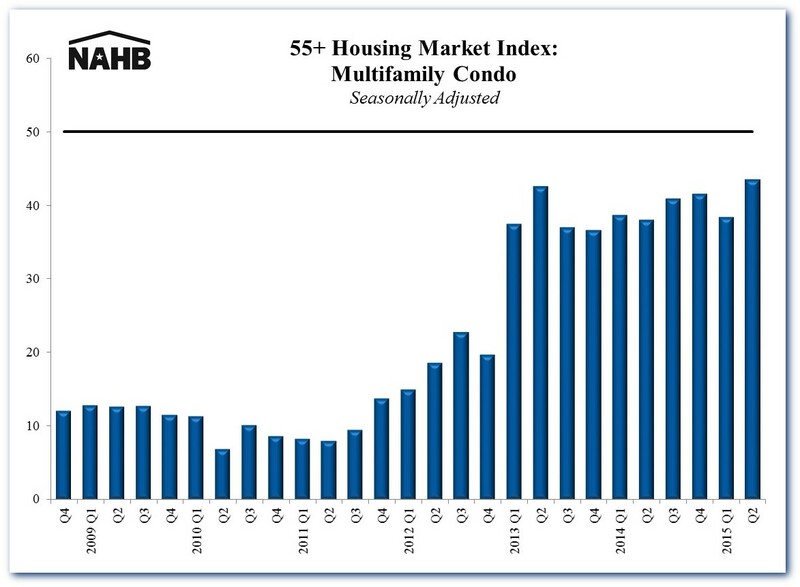 Although the 55+ HMI for condos has been below 50 since the survey began (in late 2008, during the housing industry’s down turn), it improved strongly in the second quarter of 2015—increasing by 5 points to 43. This is as high as the 55+ HMI for condos has been during its seven-year history. For either multifamily condos or single-family homes, the 55+ HMI survey asks builders if current sales, prospective buyer traffic and anticipated six-month sales for that market are good, fair or poor (high, average or low for traffic). In the second quarter, two of the three components of the 55+ single-family HMI posted slight declines: present sales decreased two points to 62 and expected sales for the next six months dipped one point to 66, while traffic of prospective buyers increased three points to 43. Meanwhile, all three components of the 55+ multifamily condo HMI posted increases. Present sales rose three points to 44, expected sales jumped 10 points to 49 and traffic of prospective buyers increased eight points to 41. For a more complete version of the results from NAHB’s 55+ HMI survey for the second quarter of 2015, please visit www.nahb.org/55hmi.